When it comes to the Christian faith, one of the most important doctrines is the resurrection of the dead/the resurrection of Jesus. Biblical faith is not simply centered in ethical and religious teachings. Instead, it is founded on the person and work of Jesus. From a soteriological perspective, if Jesus was not raised from the dead, we as His followers are still dead in our sins (1Cor.15:7). Jesus said in John 11:25, “I am the resurrection and the life; he who believes in me shall live even of he dies.” Jesus could not have made full atonement for our sins without the resurrection. Also, through the resurrection, Jesus took on the role as advocate and intercessor (1 John. 2:2; Rom. 8:34). His resurrection also guaranteed us the opportunity of having a resurrected body’s like His (1 Cor.15:20-23, 51-53; 1 Pet.1:3; Phil. 3:20-21; John. 5:25-29). An important aspect of possessing eternal life is the ability to raise the dead. The Jewish people knew the God of Israel as the only one who could raise the dead (Job 19:26; Ps. 17:15; 49:15; 73:24; Is. 26:19; 53:10; Dn. 12:2;12:13).Therefore, by claiming the authority to raise the dead, Jesus was exemplifying both the same actions and attributes of the God Israel. 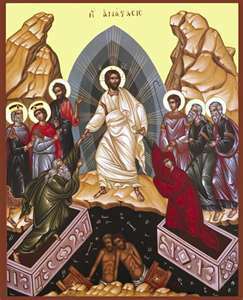 The resurrection also marked Jesus as the one who will be the judge all men (Acts 17:31). The Greek word for resurrection is “anatasis” which means “a raising up” or “rising.” I think the key is to differentiate between a resuscitation and a resurrection. There are resuscitations in the Tanakh (the Old Testament) such as the example of Elijah and Elisha raising a person from death (1 Kings 17-23; 2 Kings 4:34-35). Likewise, there are three resuscitations in the Gospels (Lk. 8:49-56; Jn. 11:38-44; Lk. 7:11-15). So if look at the life of Lazarus it seems like he was resurrected. He was “raised up.” However, Lazarus went on to live on in his old mode and still had to face a second death. Hence, Lazarus and these other accounts are similar to the raising of the dead as already mentioned in the examples of Elijah and Elisha raising a person from death (1 Kings 17-23; 2 Kings 4:34-35). As far as Jesus, he was not only but resurrected, he was changed. His body was transformed into what Paul calls a glorified body. He never died again. Therefore, one way to approach this is to say Jesus is not the only one in human history that has been raised from the dead (if we call it resuscitation). However, He is the only one who has been raised immortal! Your last paragraph contains three opinion, based on your belief. 1. He never died again. 2. Therefore, one way to approach this is to say Jesus is not the only one in human history that has been raised from the dead (if we call it resuscitation). 3. However, He is the only one who has been raised immortal! Your opinion(s) should definitely be respected, but your opinion(s) is/are not facts. Yes, there are several hundred texts and a multitude of articles (Craig, Habermas, Licona, J. McDowell, S. McDowell, O’Collins, etc.) that express your view and attempt to prove it. I have read many of these works, actually several thousand of them [LITERALLY!] and responded to them. However, there are others who do NOT accept /share your opinion. And, they too, have written texts and articles, although not as numerous that refute the Resurrection. A fair and even handed listing of works that BOTH support (7) and refute (6) the Resurrection can be viewed at michaeljalter.wordpress.com. Please click on: Recommended Reading. Regardless of your views, I appreciate the sincerity of your beliefs. A judgment is subject to doubt if there is any possibility at all (1) of its being challenged in the light of additional or more acute observations or (2) of its being criticized on the basis of more cogent or more comprehensive reasoning (see Mortimer J. Adler’s Six Great Ideas where he has a chapter called The Realm of Doubt). If having certitude is what you mean by having the ‘facts,’ than your views on the resurrection is nothing but an opinion as well (depending on what you mean by ‘opinion.’) I have seen all the atheist arguments against the resurrection. It is really more of a philosophical debate. My advice to you is to always define your terms. I don’t do much debating on my blog. My time commitments don’t allow for it. That will be it. Grace and peace.